Recognizing the need to address the issue of reducing line losses and improving the quality of power delivery, LESCO focuses on implementing distribution reforms and it could only be achieved by imparting rigorous training in professional ways to a significant number of distribution utility engineers, managers and staff personnel. 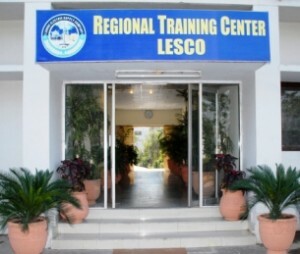 Regional Training Center (RTC), LESCO, a utility training institute was established in 1994. It puts into practice a mission oriented training with a view to enhance professional competence and efficiency of the technical and commercial staff to achieve optimum operational worthiness. RTC is a classified provider of training programs tailored for the electric distribution company. We train utility professionals responsible for the engineering, construction, maintenance, operation and customer service in which we rely. Ultimately, all levels of personnel who better understand the context of their job can become more effective at work, which benefits them and the organizations they work within it. To make learning and knowledge sharing as one of the fundamental values within the Company and across the sector. To build competency in employees and thereby add to the resource pool of the sector as a whole. To Familiarize all personnel with existing and new technology in the Power Distribution sector. LESCO has a wide range of workforce that require different levels of training, and RTC offers customized courses for specific professionals that enable them to get the right instruction they need at a level consistent with what they do in the company. RTC currently administers training to approximately 3000 Company’s employees a year. The majority of our training is "hands on", learner centered and compliance focused to better prepare and qualify an individual for the specific "task at hand". Trainees study and practice those skills that have not yet been mastered to the level required by the objectives. Trainees are given opportunities to practice each objective and obtain feedback about the quality of their performance. Trainees receive repeated practice in skills that are used most often or that are difficult to learn. Training programs are presented in a modular format. A module will “stand alone” as a skill builder for a particular job classification. Each module contains the same basic elements. Employees are more confident in their ability to properly and safely perform their jobs. System performance is enhanced substantiality. We believe training play a significant part in capacity building of the individual as well as the system. After the programs’ inception at LESCO, the company experiences low employees accident rate. This training will not only benefit the employees taking the courses, but also benefit the employees who serve as assistant course administrators. By administering the courses, those employees are able to keep their own skills current.